Every year online retails capitalize on the Christmas season by offering rock bottom deals for Cyber Monday. Still I hardly ever get excited for this, at least not when it comes to Outdoors gear because similar sales are available year round if you know where to look. 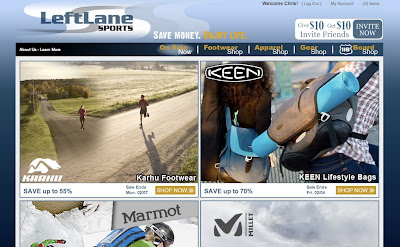 I recently discovered LeftLane Sports through Modern Hiker who advertised a deal of theirs. I signed up for an account and spitefully did it through the site's main page as opposed to the link provided because I didn't like the idea of a blog receiving a commission for me. Only in the process I also cost myself $10 (when you sign up on a reference both parties get $10), and also I have no idea why I wouldn't want to support Modern Hiker because it's a phenomenal southern california hiking blog. Aside from my regrettable introduction to LeftLane I'm so far very impressed with their deals, and their layout. 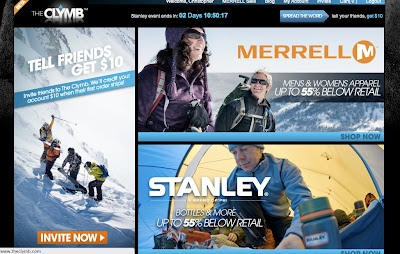 Every few days they offer a different deal from a different brand (commons outdoor brands include Solomon, Merrell, Arc'teryx, Cloudveil, Columbia, etc.) in a very similar manner to The Clymb. Both are also membership sites that typically send you emails with their daily deals. I'm not crazy about their return policy (2 weeks, store credit only) but it's better than nothing. I am, however, crazy about their shipping. It's free on orders over $50 and uber fast. Standard shipping usually arrives on my doorstep within 2 days of my purchase. I don't know what palms they've been greasing over there but it's working. I'm a big fan of LeftLane. 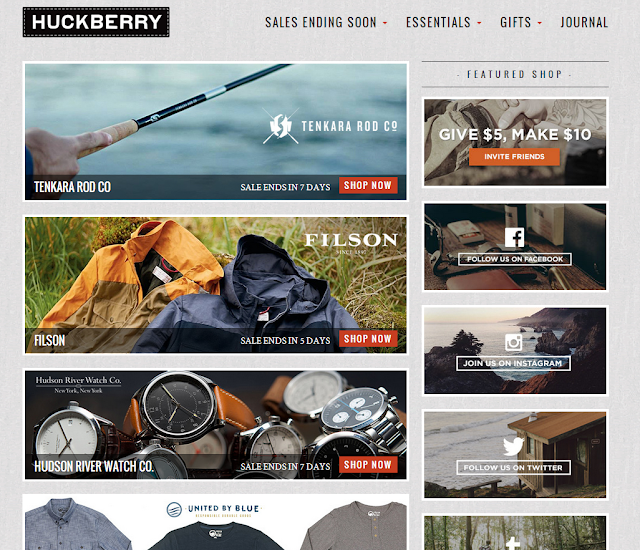 Huckberry is kind of like the Eddie Bauer of discount websites. Their focus is not on the technical gear (tents, running shoes, down jackets, etc) so much as outdoor lifestyle clothing - think flannel shirts, rucksacks, and leather belts. The kind of outfits that look like they'd smell like pine smoke. The discounts don't seem to be as steep as other sites but the brands look to be universally high quality. In fact the site has perhaps the best curation of any discount website I've visited. Also their based in San Francisco (I really appreciate that their "Follow us on Instagram" is a picture of the Steep Ravine cabins). I have not yet purchased a product from them but their shipping terms sound very similar to The Clymb - ie. they do "pre-sales" and ship at the conclusion of each sale. Currently they don't take Amex. That's a bummer. Several months ago I plugged The Clymb and I'll do so again now. I am constantly finding tempting deals there which had I less willpower would certainly have sent me to the poorhouse by now. On the occasions I have ordered items I've been impressed at the speed of delivered and condition they arrive in. As a good Portland, OR company should, they offset all their shipping with carbon credits. Due to the deserved popularity of the site items do sometimes sell out VERY rapidly, like under two minutes rapidly. Logging in to check out a sale, finding that backpack you'd had your eye on for awhile and seeing a big "sold out" bar can sometimes be frustrating. By in large their stock is usually pretty full for at least a day or so and its hard to say no to 50-70% discounts. Their packaging and shipping is pretty slow to my doorstep. I've had items take almost a month to be delivered in the past. Still, since they are based in Oregon there is no sales tax - so take another 9% or so off. Discounts on discounts on discounts. 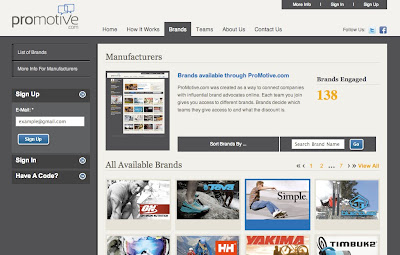 ProMotive is a little more exclusive than the other gear websites listed here once you join, you'll need to apply to subgroups within the site (ex. Ski Patrollers, Bloggers, Military Members). These subgroups each have deals from different companies looking to promote items at heavy markdowns. You can join as many groups as you qualify for. The idea is to give people with an audience a discount on gear so they can then promote it (promote-ive, eh? eh?). The deals are better than the other websites, and you don't have to worry about missing a particular promotion because most of brands will keep their gear available for awhile. Disclaimer: Both LeftLane and The Clymb credit me $10 when you follow the links I provided and sign up. If you'd prefer to sign up with Left Lane or The Clymb follow the links down here. I won't be offended. If you think I missed something send me an email at chris@backcountrybliss.net and let me know. "I have noticed a tendency for items to be "sold out" as soon as the sale starts, which I find irksom and in some ways dishonest (why list it if it was never available to begin with?)." We don't list items we don't have as sold out. Thanks Kevin. I'll make sure to correct that and be a little more diligent in my fact checking next time. No problem at all. I'm just happy you are writing about us. It's great that you put that out there and we are able to talk about it. I'd rather have an open discussion than having people think these things and not saying it. It is understandable to think what you thought when you get in and see stuff gone. Honestly though this is another problem onto itself so we have been working hard on securing larger quantities of product and if there are broken size runs or limited product of some models we won't list it on the site.